It would seem after looking at the last few posts I've written, that I'm in a sandwich mood lately. Dev and I have become really spoiled when it comes to ice cream. Sometime last year I purchased a cheap countertop ice cream maker. You know, the kind you have to store the barrel in the freezer til it's time to use it. I think ours has a 2 quart capacity. Anyhoo, we now can have really good home made ice cream whenever we want. The other day I had a batch of vanilla in the freezer, when suddenly I had a WICKED craving for an ice cream sandwich. The kind I usually buy at the store has a 2 chocolate chip cookies with vanilla ice cream in between, so I thought, why not make a batch of home made cookies and then use the home made vanilla to make the sandwiches? Whisk the eggs in a mixing bowl until light and fluffy (1 to 2 minutes). Whisk in sugar, a little at a time, then continue whisking until completely blended (about 1 minute more). Pour in the cream and milk and whisk to blend. I put the mixture in the freezer for about 10 minutes while I set up my ice cream maker. Then I turn on the machine, pour it in, and in about 20 minutes I have soft serve vanilla ice cream. I scoop it into a plastic container and put it back in the freezer to harden up before serving. Preheat oven to 375 degrees. In a bowl, cream the butter and sugar, then beat in vanilla. Add the eggs one at a time, beating well. Add the flour 1/2 cup at a time, continuing to beat. Stir in the nuts and chocolate chips. Drop dough by heaping tablespoon onto ungreased cookie sheets. Bake for 10 to 12 minutes, until golden brown. This recipe made 24 really big cookies for me. You can make them smaller if you aren't using them for sandwiches. So after the cookies cooled, I chose 4 of the biggest and made the ice cream sandwiches out of them. It wasn't entirely successful. 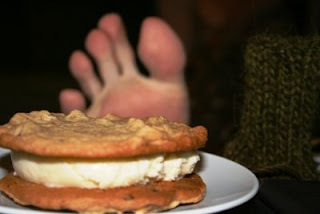 I really think you need to use a softer cookie to make these, because when you bite into the sandwich, you want the cookie to give and allow you to get to the ice cream. These were a bit stiff. But they still tasted really good!